AT BASHES WE PRIDE OURSELF ON THE HIGHEST QUALITY PRODUCTS AND EQUIPMENT POSSIBLE FOR OUR CUSTOMERS. WHILE THIS COSTS US MORE AND REQUIRES EXTRA TIME AND EFFORT WE NEVER WANT TO COMPROMISE OUR HIGH STANDARDS. THE NEW HELIUM PRICE INCREASES ARE IN LINE WITH INDUSTRY STANDARDS AND ALSO REFLECT A RISE IN COSTS ACROSS EXTERNAL SUPPLIERS AND SERVICES. 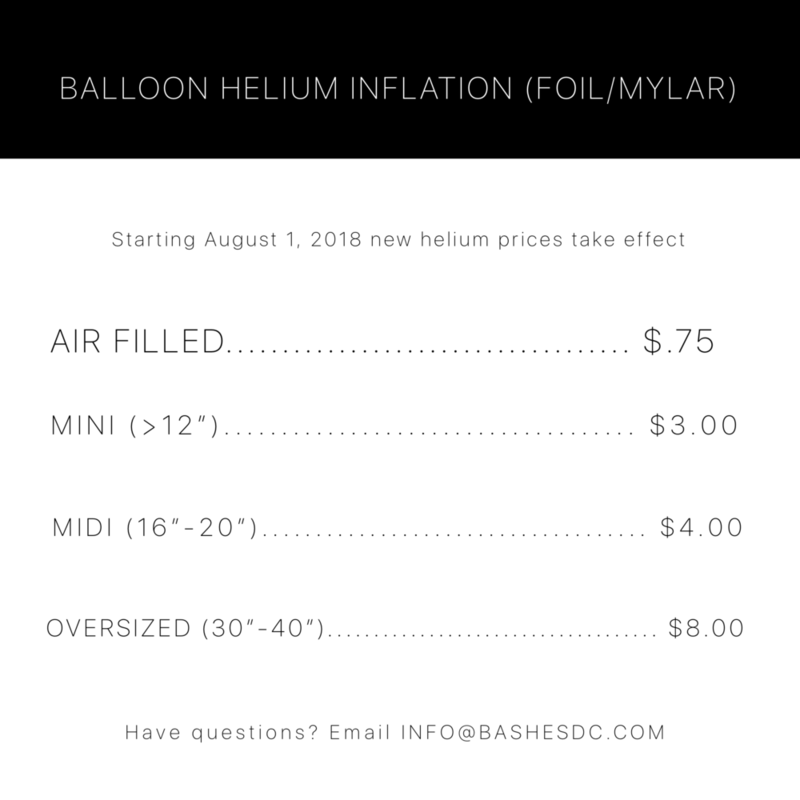 UNLIKE MOST COMPETITORS WHEN YOU PURCHASE BALLOONS FROM BASHES YOUR PRODUCTS ARE FILLED WITH 100% HELIUM TO OFFER YOU BETTER FLOAT TIMES FOR YOUR PREMIUM BALLOONS. IF YOU HAVE ANY QUESTIONS REGARDING THIS CHANGE PLEASE EMAIL US AT INFO@BASHESDC.COM.